The President of India, Shri Pranab Mukherjee expressed happiness over Indian Institute of Science (IISc), Bengaluru attaining the fifth position in the QS BRICS Universities Ranking 2015 and 31 Indian institutions figuring in the top 200 of the ranking. He was speaking after receiving a detailed analysis of India’s performance in the QS BRICS Universities rankings today (July 11, 2015) from Mr. Mohandas Pai, Chairman of the Indian Centre for Academic Rankings and Excellence (ICARE) at Rashtrapati Bhavan. The ICARE has been helping Indian Institutions of higher learning better understand global ranking parameters and encouraging their pro-active participation in the global ranking process. Mr. Pai informed the President that IISc not only ranks number 5 across Universities in all BRICS nations but is also ranked number 1 among BRICS countries in the parameter pertaining to research papers per faculty. He said 31 Indian Institutions have figured in top 200 in the 2015 QS BRICS Ranking, a rise from 20 in 2014. In the top 400, India has 94 institutions. More complete data from Universities in India has been responsible for much of the improvement in performance. Data collection still remains the greatest challenge in India. 50 Universities did not provide full data in spite of constant follow up and request. Responding to the presentation, the President said it was a proud moment for him and his associates at Rashtrapati Bhavan. Over the last two and a half years, he has addressed around 100 academic congregations calling upon them to improve their position in global ranking. India has outstanding and inherent talent, in both students and teachers which should be given a conducive environment to blossom. Nobel laureates like Har Gobind Khorana, S. Chandrasekhar, Dr. Amartya Sen and V. Ramakrishnan did their graduate or post-graduate studies in Indian Universities before they went abroad for higher learning. Our institutions sometimes are complacent and presume that the world is aware of what they are doing. If they come out of this mindset, they can achieve wonders. It is important to let the world know what their achievements are. The President expressed happiness that a large number of Central Universities have responded to his appeal to take measures to improve the quality of education, set up innovation clubs, create Networks of Inspired Teachers etc. He said Indian Universities have the potential to be the best, provided they can apply themselves to the task of improving quality and submit regularly relevant information to the ranking agencies. The President said he intends to interact with students and faculty of higher education institutions through video conferencing in the month of August using the National Knowledge Network. The President of India is ‘Visitor’ to 114 Institutes of higher learning including all Central Universities, Indian Institutes of Technology, National Institutes of Technology, Indian Institutes of Science Education and Research, the Indian Institute of Science and Indian Maritime University. In his capacity as ‘Visitor’, the President has visited 99 institutions since he assumed office. He has also convened in Rashtrapati Bhavan three conferences of Vice Chancellors of Central Universities, two conferences of Directors of NITs and one conference of Chairmen, Board of Governors and Directors of IITs in the last three years. The President has instituted Visitor’s Awards for the best Central Universities to promote healthy competition and motivate them adopt best practices from around the world. Further, the President has in all his foreign visits, included representatives of academic institutions as part of his accompanying delegation with a view to promoting international collaboration in education and research in our universities. 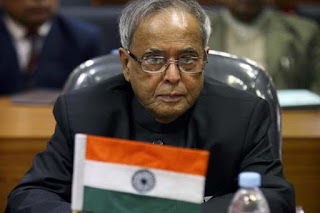 The President of India, Shri Pranab Mukherjee has congratulated the Indian Space Research Organization (ISRO) for the successful launch of PSLV-C28. In his message to Shri A.S. Kiran Kumar, the Chairman of ISRO, the President has said, “My heartiest congratulations to you and your entire team at the Indian Space Research Organisation (ISRO) for the successful launch of PSLV-C28, carrying 5 satellites. I am happy to know that this launch is the heaviest commercial mission ever undertaken by ISRO. The launch of PSLV-C28 is an important landmark in our space programme. Please convey my greetings to all members of your team of scientists, engineers and technologists involved in this mission. I wish all your future endeavours great success”. The Prime Minister, Shri Narendra Modi, today inaugurated a Traditional Medicine and Yoga Centre in Ashgabat. He also unveiled a bust of Mahatma Gandhi. Speaking at the occasion, after witnessing a Yoga demonstration, the Prime Minister said that this was an occasion of immense happiness for him - where children greeted him in Hindi, a bhajan was sung as the bust of the Mahatma was unveiled, and some Yoga asanas were demonstrated so accurately. The Prime Minister referred to his meeting with Turkmenistan President Mr. Gurbanguly Berdimuhamedov earlier today, and said that the President had said this was a small beginning towards his vision of a world class Yoga Centre, which would demonstrate the effects of Yoga to people. Referring to Mahatma Gandhi, the Prime Minister said the solutions to two big problems facing mankind today - terrorism and climate change - could be found in the life and thought of Mahatma Gandhi. The Prime Minister hoped that the Yoga Centre and the Mahatma Gandhi bust would spread a positive message across Central Asia. The Prime Minister, Shri Narendra Modi, today presented President of Turkmenistan, H.E. Mr. Gurbanguly Berdimuhamedov, a specially handcrafted horse saddle. President Berdimuhamedov is a keen horse rider and known for his passion for horse breeding, racing and equestrian. It is a great pleasure to visit Turkmenistan. I am also delighted to see Ashgabat. It stands on a once thriving trade route since ancient times. It is now a beautiful 'Ak Shaharim' or the White City. It reflects your great vision and the nation's prosperity. We had a very positive discussion on India's interest in investment in downstream industries, including petrochemicals and fertilizer. The Memorandum of Understanding in the fertilizer sector will enable long term arrangements for supply of fertilizers from here to India. Together with the Kazakhstan-Turkmenistan-Iran rail link, and India's proposed investment in Chahbahar Port in Iran, these initiatives will strengthen connectivity between our countries. Prime Minister, Shri Narendra Modi, has congratulated the Indian Space Research Organisation team for the successful launch of PSLV-C28. "Successful launch of PSLV-C28 with 5 UK satellites is a moment of immense pride and joy for India. Congratulations to the ISRO team," the Prime Minister said.